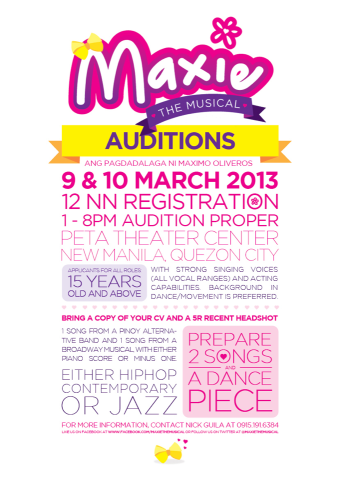 Auditions are set on March 9 (Saturday) and 10 (Sunday), 2013 at Studio A of the Peta Theater Center, No. 5 Eymard Drive, New Manila, Quezon City. Registration starts at 12 noon. Auditions begin at 1 p.m. and will end 8 p.m.
Auditionees are advised that they are expected to sing, dance and act with equal facility. MAXIE - Must look 13 -15 years of age. Must be androgenous; able to pass off as both male and female. Has a strong soprano voice. Must be able to dance. If auditioning for this role please prepare a pop song that will showcase your vocal range. VICTOR - Police officer, object of Maxie’s puppy love, affection. Must look like in his mid to late 20s. Should be willing to appear on stage in underwear. Strong baritone or tenor voice. Must be able to sing both ballad and rock songs. BOGS - Early 20s. Maxie’s brother. Preferably able to play the guitar. If auditioning for this role, please prepare a slow OPM song and showcase guitar ability. BOY - Late 20s. Maxie’s brother. Eldest of the siblings. Strong baritone voice. ART - Mid to late 20s. Victor’s police partner. Willing to play multiple roles. PETER - 15-17years of age. A closet bully. Must have comic timing. Background in dance is preferable. PACO - 40’s. Petty crime lord. Maxie’s father. Must have a strong Tenor voice. “Maxie The Musical: Ang Pagdadalaga ni Maximo Oliveros” is set to open on Nov. 15, 2013 and will run until Nov. 24, 2013 at the Peta Theater Center in New Manila, Quezon City. For more information, visit the official Facebook page at www.facebook.com/MaxieTheMusical.